Toronto to Reykjavik, Iceland - $240 CAD roundtrip including taxes (sort of) | August and September 2017 ! WOW Air has dropped some of their August and September 2017 flights from Toronto to Reykjavik, Iceland down to $240 CAD roundtrip including taxes. 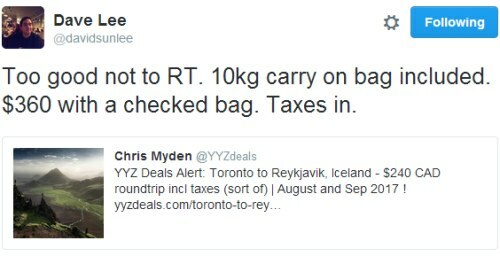 Although with WOW Air, one should probably think of it as really being $360 CAD roundtrip with 1 checked bag, as WOW Air does not include any checked luggage in their prices. This is still a pretty amazing price for peak summer travel. 1 small carry-on, weighing up to 10kg, and a maximum size of 42x32x25cm is included. It's rare to see deals to Iceland for August travel, being one of the two most desired months to visit (July being the other). June and September are the next best choices. 8 Responses to "Toronto to Reykjavik, Iceland - $240 CAD roundtrip including taxes (sort of) | August and September 2017 !" It's currently 12:43 am and I just tried booking this deal to Iceland and it's a "no go"... they want twice that amount! Seats sold iut already? ?? I did not book because that was too far in advance to commit. Cannot find deal. Probably gone already. Update @ 11:50 AM (Oct 14) - It looks like only the second half of September still has the cheaper fares. Suggest you do a Google on WOW Airline Complaints FIRST! They're NOT very good! BUYER BE WARNED! Most complaints I read about Wow Air are from people not knowing they are a low cost carrier. No in-flight entertainment, pay extra for baggage, snacks, etc. I just flew Wow air last week and they are great for what they are, a low cost carrier that gets you from point A to point B at a no frills price. What might seem like a low cost airline is a falosy with WOW Airline! What WOW Airline has done is unbundle every possible line item! Once you add up all costs including a cup of water (yes if you you want water it will cost you) you'll realize very quickly it's no bargain. Furthermore, their cheap flights are extremely limited and non existent unless you want to travel during the most inopportune time. 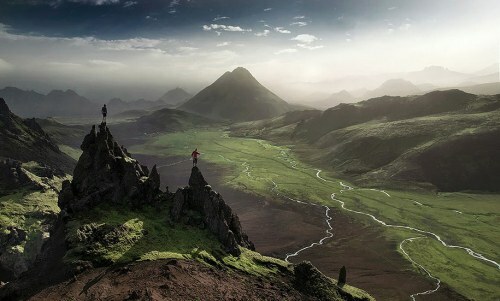 You'd be better off going with Iceland Air who have plenty of cheap fares along with Stopover deals.